Uncertainty in Brocade reached an all-time high when Broadcom announced its acquisition of the company. The announcement of Extreme’s purchase of the Data Center business doesn’t change the fact that your network is too important to rely on a vendor in transition and doubt. And the future of your infrastructure is too important to trust a vendor without a clear roadmap to meet your future needs. It takes a leader in enterprise networking, data center, and cloud infrastructure to take your business where you want it to go: Juniper Networks. Top companies, government agencies, and educational institutions with critical networking infrastructure trust Juniper Networks. 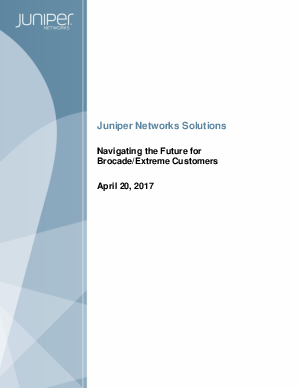 Brocade customers can have 100 percent confidence in Juniper’s technology, too. Juniper ranked as most trusted vendor to deliver next-generation infrastructure and services in a 2015 study released by Light Reading. Download this whitepaper to learn how to navigate the future of brocade!